The Middlesex County Landfill, to be exact. 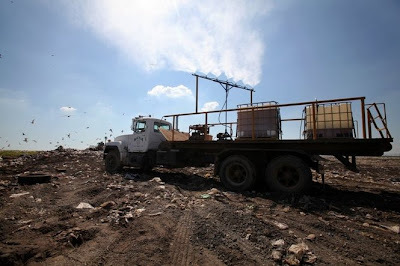 The Star-Ledger reported yesterday that the East Brunswick dump is the site of the latest in cutting-edge olfactory technology: flatbed trucks loaded with vats of industrial-strength perfume, sprayed pesticide-style over the garbage and rat corpses. Bigger than six football fields, the landfill is one of the largest active dumps in the country, with 1,000 tons of rubbish arriving daily. All that garbage means a non-stop fiesta of fetidness for nearby residents, who have complained about the stench for the last five years. A sprinkling of baking powder wasn't going to cut it, so Richard Fitamant, executive director of the Middlesex County Utilities Authority, brought in the big guns: glorified body spray to freshen up the 200 square acres of rotting crud. "It’s not offensive and it’s not overpowering. It’s a light scent.” Fitamant said. "It’s a neutralizing agent. The spray attaches to the odorous particles in the air and drops them down." But drops them where? Landfill neighbor Alicia Edwards says all she smells is "garbage," no deodorizer. "I understand it’s there, but please," she said. "(The landfill operators) should come and sit and have a barbecue with me. Then they’ll know what its really like. It’s a shame." Fumies, what garbage dump perfume might we smell at Ms. Edwards' barbecue? I vote for one of those aggressively sudsy ones from the Clean line. Warm Cotton, perhaps. Wrong approach! Fight fire with fire, I say. On the next pass-through, they should try a good soaking of a heavy-duty Opium/Cinnabar-type perfume from the late seventies/early eighties. A good dose of cinnamon, clove, carnation, patchouli and vanilla (the latter to calm things down a bit) might do wonders to eat the stench, rather than simply attempt to "neutralize" it. I mean, really. Neutralize? Nope. Destroy. I know that China is doing the same thing with a dump in Beijing. Talk about layering your scents! Its a light scent, oh that is just too much. Sounds like BP saying, they just had a small leak! The "light scent" clearly wasn't cutting the mustard, so I am with Melisand61 on sending in the heavy hitters! See, New Jersey needs to bring y'all in to consult on this matter. Thanks for breaking it down, Sabrina: a rose by any other name is still "garbage soaked in perfume". Although the "neutralizing agent" is supposedly the masking chemical here. You're funny, Moonchime! Good idea, let's make "barbeque at Alica's without throwing up" the success test for the dump perfume. flittersniffer, "Gestankfestlichkeit" could be Jersey's version of "Oktoberfest." Too right, Gojira - "just a light scent for a tiny stench." melisand61 - yep, this is no time for pussyfooting around with "your skin but better" fragarance.